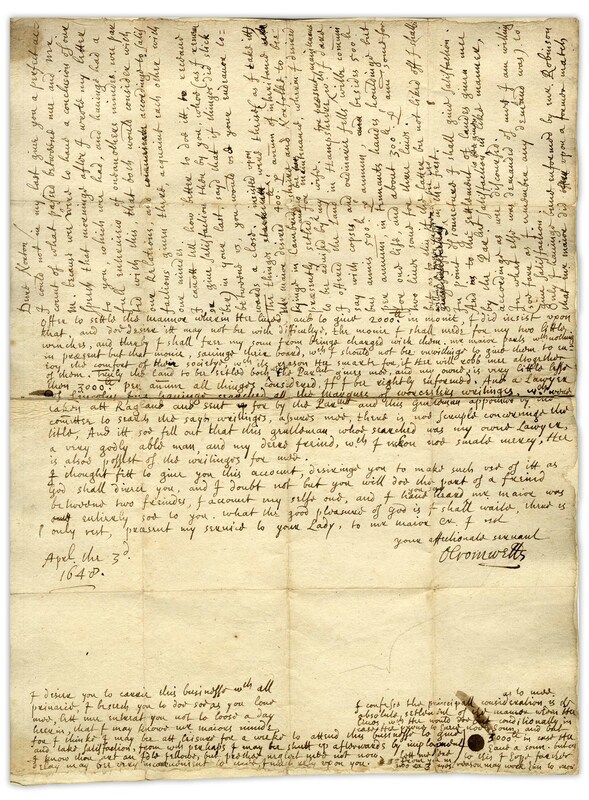 Oliver Cromwell autograph letter signed with intriguing content regarding the proposed marriage of his oldest son Richard to Richard's eventual wife Dorothy, the daughter of Richard Maijor. Letter is important not only for its date -- 3 April 1648, as the Second English Civil War was brewing, but also for the pairing of the young couple. Quoting from Cromwell's biographer Samuel Church in ''Oliver Cromwell, a History'', the choice of companion for his son revealed Cromwell's character: ''Had Oliver at this time cherished the bold schemes for dominion which his enemies impute to him, he would never have sought this obscure alliance with the daughter of a country gentleman.'' Indeed this ''country gentleman'' had only served as High Sheriff of Hampshire before the marriage of his daughter, but would subsequently serve as Member of Parliament, as well as in Cromwell's English Council of State. 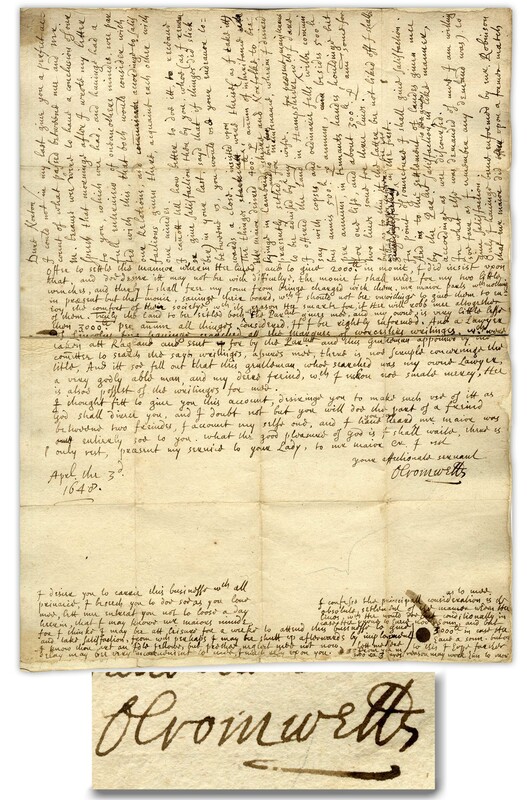 ''Dear Norton / I could not in my last give you a perfect account of what passed between me and Mr. M[aijor] because we were to have a conclusion of our speed that morning after I wrote my letter to you. Which we had, and having had a full interview of one another's minds, we parted with this, that both would consider with our relations, and according to satisfactions given there, acquaint each other with our minds. I cannot tell how better to do it, [?] give satisfaction than by you, who (as I remember) in your last, sayd that if things did stick between us, you would use your endeavour towards a close. The things insisted upon were these (as I take it). Mr. Maijor desired 400l. per annum of inheritance, lying in Cambridgeshire and Norfolk, to be presently settled, and to be for maintenance, wherein I desired to be advised by my wife. I offered the Land in Hampshire for present maintenance which I dare say with copses and ordinary fells will be communibus annis, 500l. per annum, besides 500l. per annum, in tenants hands holding but for one life, and about 300l. per annum, some for two lives, some for three lives. But as to this if the latter be not liked of I shall be willing a farther conference be held in the first. In point of jointure I shall give satisfaction. And as to the settlement of lands given me by the Parliament, satisfaction to be given in like manner, according as we discoursed. For what else was demanded of me I am willing (so far as I remember any demand was) to give satisfaction. Only, I having been informed by Mr. Robinson that Mr. Maijor did, upon a former match, offer to settle the Manor wherein he lived, and to give 2,000l. in money, I did insist upon that, and do desire it may not be with difficulty. The money I shall need for my two little wenches, and thereby I shall free my Son from being charged with them. Mr. Maijor parts with nothing in present but that money, saving this board which I should not be unwilling to give them to enjoy the comfort of their society, which it's reason be smart for, if he will rob me altogether of them. Truly the land to be settled both what the Parliament gives me, and my own, is very little less than 3,000l. per annum, all things considered, if I be rightly informed. And a Lawyer of Lincoln's Inn having searched all the Marquis of Worcester's writings, which were taken at Ragland and sent for by the Parliament, and this gentleman appointed by the Committee to search the said writings, assures me, there is no scruple concerning the title, And it so fell out that this Gentleman who searched was my own Lawyer, a very godly able man, and my dear friend, which I reckon no small mercy, He is also possessed of the writings for me. Two page letter on bifolium measures 12'' x 15.5'' unfolded, ideal for framing. 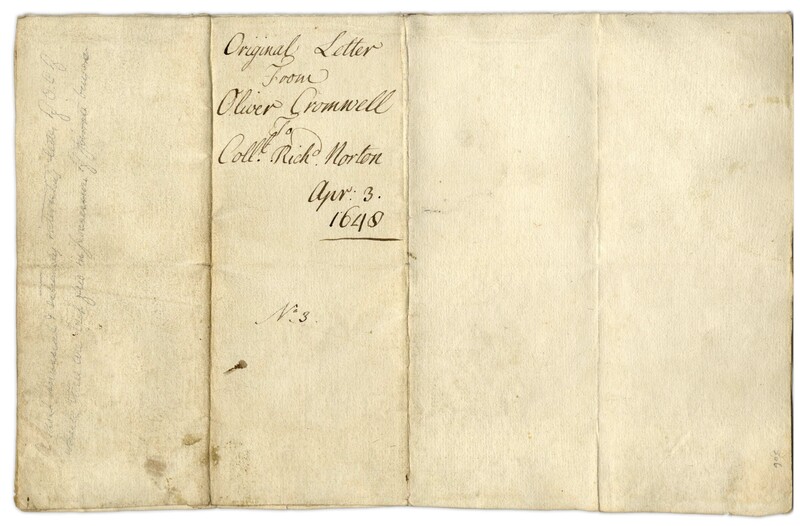 Letter is laid on paper with flattened folds. Overall very good condition with bold writing and signature.